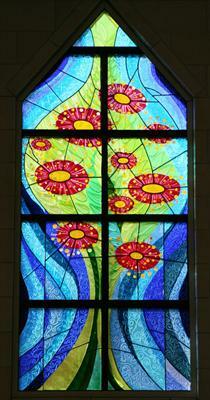 These two windows are located in the main worship area at Christ Church and were commissioned of local artist Andrea Tindle for the new Mc Neilly Worship Area opened in 2007. 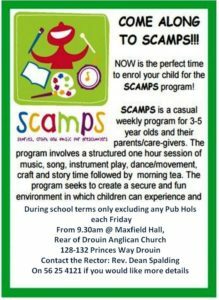 Throughout its history, particularity now with increasing population, Drouin has so much potential. 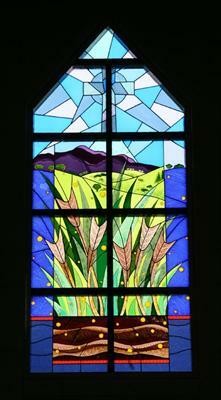 With the illustration of rich, fertile soils, rolling green hills and Mt Baw Baw in the background, the parable of the sower is shown with local flavour. We have a community we can nurture and love, as our Heavenly Father loves an nurtures us. 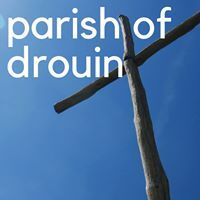 The North Sanctuary window: one of the most recognizable symbols of Drouin is the Ficifolia tree which has been adopted by many community groups. The tree of knowledge takes centre stage and the river of life flows around it. Each flower and leaf symbolizes the diversity of our community, representing different sections of our community that work together to create our town identity. The tree is never ending, reaching up to the heavens, linking our community to the rest of the universe. The river of life flowing around the tree symbolizes our journey forward. As individuals we can move freely along this river, connecting us not only to our community but also to the rest of the world and a myriad of possibilities. The rich gold pinks of the flowers is symbolic of Christ, central to our community and tying it all back to Christ. 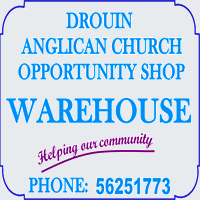 Christ Church Drouin has a collection of seventeen stained glass windows and 1 crucifix created by Stained Glass Artist Jean Orval during the 1970s.